where a ≠0, b > 0 , b ≠1, and x is any real number. The base, b, is constant and the exponent, x, is a variable. 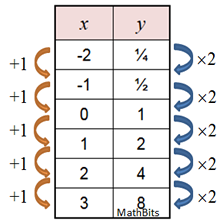 In the following example, a = 1 and b = 2. Shape: Most exponential graphs will have this same arcing shape. This graph does not have a constant rate of change, but it has constant ratios. It is growing by common factors over equal intervals. • the domain is all Real numbers. • the range is all positive real numbers (not zero). 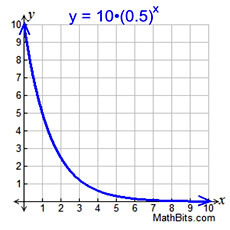 the zero power is 1.
the faster the graph rises from left to right. • when 0 < b < 1, the graph decreases. 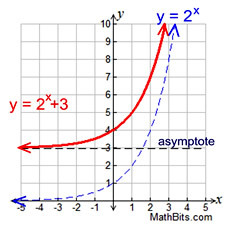 asymptote is the x-axis (y = 0). y increases by x 2. Graph with 0 < b < 1. 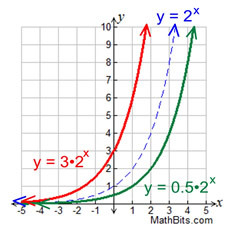 Each time x in increased by 1, y decreases to ½ its previous value. Compare graphs with varying b values. 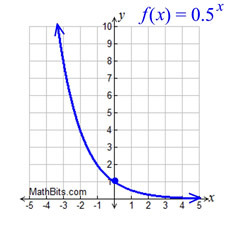 In word problems, you may see exponential functions drawn predominantly in the first quadrant. Notice the points (0,1), (3,1), (-3,1). Vertical Shift up 3 units. 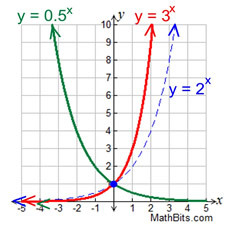 asymptote at y = 3.
y-intercepts at (0,1), (0,3), (0,½). which relate to formula's "a" value. We have seen that exponential functions grow by common factors over equal intervals. 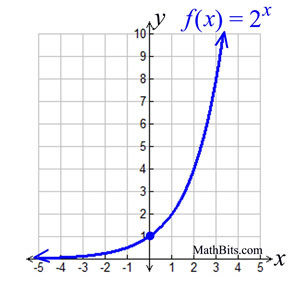 As such, exponential functions are used to model a wide range of real-life situations (such as populations, bacteria, radioactive substances, temperatures, bank accounts, credit payments, compound interest, electricity, medicine, tournaments, etc.). Any quantity that grows (or decays) by a fixed percent at regular intervals is said to possess exponential growth or exponential decay. slowly at first, and then very rapidly. The rate of change increases over time. The rate of growth becomes faster as time passes. This rapid growth is what is meant by the expression "increases exponentially". 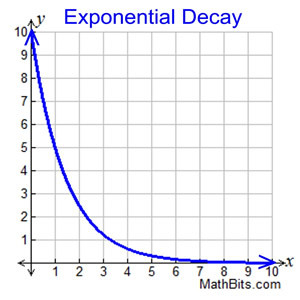 In exponential decay, the quantity decreases very rapidly at first, and then more slowly. The rate of change decreases over time. The rate of decay becomes slower as time passes. We will be looking at the following two function formulas which can be easily used to illustrate the concepts of growth and decay in applied situations. If a quantity grows by a fixed percent at regular intervals, the pattern can be depicted by these functions. 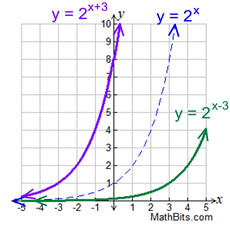 Remember that our original exponential formula was y = abx. the b value (growth factor) has been replaced either by (1 + r) or by (1 - r). The growth "rate" (r) is determined as b = 1 + r.
Example 1: A common example of exponential growth deals with the growth of bacteria. Bacteria have the ability to multiply at an alarming rate, where each bacteria splits into two new cells, doubling the number of bacteria present. Let's start with one bacteria which can double every hour. How many bacteria will be present after 8 hours? Note: While there are only 256 bacteria after 8 hours, there will be over 16 million bacteria after 24 hours. represented by y = 2x. and r = 100%, since the amount doubles. Notice that the graph is a scatter plot. You cannot have a fractional part of a bacteria. The dotted line is the exponential function which contains the scatter plots (the model). Note: In reality, exponential growth cannot continue indefinitely. Eventually, there would come a time when there would no longer be space or nutrients to sustain the bacteria. 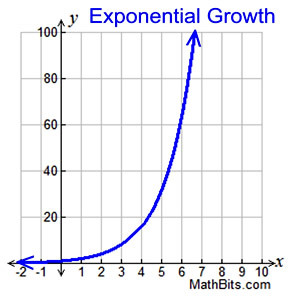 Exponential growth refers to only the early stages of a process and to the speed of the growth. Example 2: The NCAA Basketball Championship (also known as March Madness) is an example of exponential decay. At each round of the tournament, teams play against one another with only the winning teams progressing to the next round. In other words, the number of teams playing at each round is half of the number of teams playing in the previous round. Let's start with 64 teams going into round 1. How many teams are left to begin play in round 5? The pattern tells us that this situation can be represented by . and r = 50%, since the number of teams are cut in half each round. with only four teams remaining to play.